Walking down Reichenberger Straße, Adam and Rasto fall into a debate about whether the lamps are gas or electric. Adam says they are gas, and Rasto doesn’t believe him. 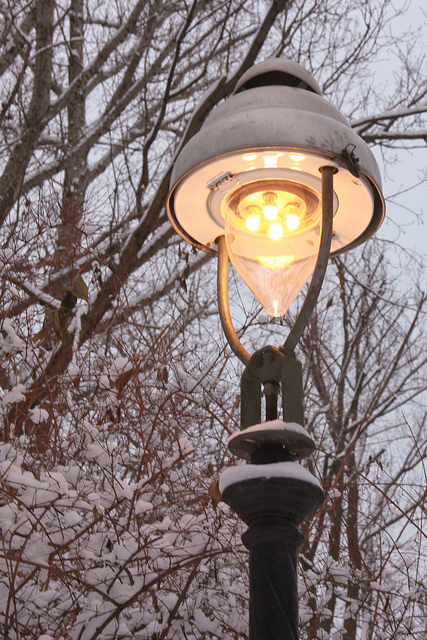 “Gaslamps have a certain sound,” Rasto says. He stops next to one of them to listen. “It sounds like gas,” he says skeptically. “If it’s gas, you should be able to make them turn on or off by kicking them,” Rasto says. He kicks a dark lamppost and watches it come on. He kicks another one and nothing happens. “It could be gas,” he says. Adam then points out that gas lamps give off a warmer, more amber color. Rasto agrees and goes in for a closer look, stepping on top of a snow-covered bicycle to hoist himself halfway up the lamppost. He shakes the pole and watches the lamp-light flicker, his eyes lighting up with this brightness of his discovery.